Here is a little bit more information (Aand some further photos) about the actual castle from which the town derives its name. 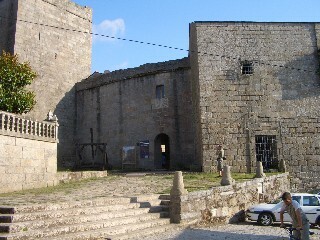 The castle is open during the typical restrictive hours of Galician tourism (i.e. it is closed between 2.00pm to 5.00pm when you are most likely to want to visit) and shuts completely at 8.00pm. However, making the effort to visit Castro Caldelas while the castle is open is well worth the effort. The castle is hard to do justice to in photographic form and its appearance, seemingly perched on the top of a mountain, captures your attention as soon as you spot it. You are then further enthralled by the small town that sits to the side of this ancient monument with it church and little town square. Like most ancient castles this one has many ruinous parts, but the basic structure is still intact and you can enter and climb up its various sections including the tower keep. (There are no ridiculous UK or USA Health and Safety regulations to worry about here). The location of the castle, on top of a mountain, also provides some panoramic views of the valleys below and it is easy to appreciate how impenetrable this town must have seemed to past aggressors. You enter the castle (free of charge) through the main gateway and once inside you have unlimited access to all areas including the battlements. 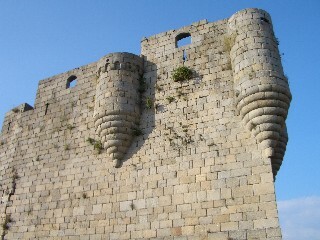 The views are spectacular and the castle structure is the defining feature of Castro Caldelas. When we were there, between the hours of 7.00pm and 8.30pm, the town was not overly busy and we suspect that only a limited number of tourists actually make the journey. Interestingly though there were two other English speaking groups in the town and both seemed satisfied with what they saw. 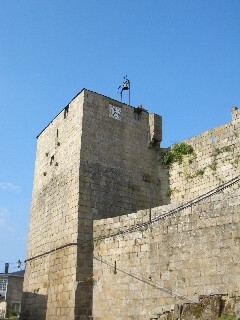 All told the town of Castro Caldelas is a worthwhile tourist attraction and the castle is undoubtedly the high point. Walking around this small town was interesting and the views, from any vantage point available, were spectacular. The only down points were the route we selected and the fact that one of the churches had no public access. The availability of bars around the little square, plus two small restaurants (near the castle), took away the need to rush off once the sightseeing visit was over and the laid back atmosphere of the town all added to its tourist appeal. The only real downside to Castro Caldelas is its comparatively remote location away from the spots where most tourists tend to base their Galician explorations. If it were in a more accessible location it would undoubtedly be one of the top tourist attractions in Galicia.